Everyone loves freebies, and who’s more deserving than the birthday boy or girl! 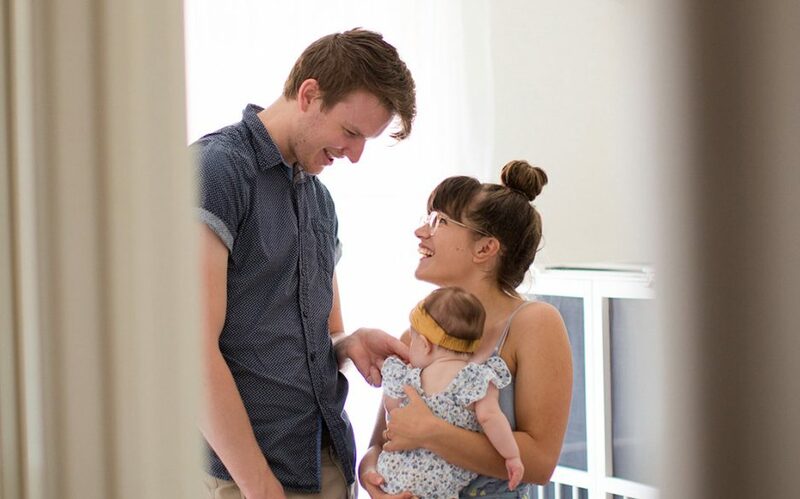 Here’s a round-up of all the things you can score when your birthday comes around (I hope you can eat a lot because there’s a lot of free food up for grabs). There’s also bound to be things I have missed so leave a comment if you have more to add to this list! Nandos will give you a whole free birthday meal on any day during your birthday month. You must become a member before your birthday in order to receive your voucher via email. Boost Juice Vibe Club members receive a free original size juice on their birthday. This offer can also be claimed on one of the two days either side of your birthday. Grill’d Relish members get a free drink on their birthday with the purchase of a burger. (I’ll admit after the first two this one is a bit of a let down, at least throw some chips in there!). But wait it gets good again… San Churros will delight you with a free churros for two on your birthday. You do need to be a member of their El Social club, but even if you sign up on your birthday you can still claim your free churros – now you’re talking! Jamaica Blue gives members a free slice of cake to celebrate their birthday. You can sign up on your birthday in store and claim your cake right away. Plus, new members also get a free coffee – morning tea sorted! Muffin Break members can score a free birthday muffin. Join the Eat Fresh Club at Subway to receive a free lunch. The Outback Jacks Birthday Club gives members a free main course meal up to the value of $35 during their birthday month. However, it’s only valid when two or more main meals are ordered. If you book a table for four or more there’s also an extra birthday surprise (I have no idea what this is but if anyone does let me know in the comments). Cold Rock gives VIP members free ice cream and a cake voucher. You must have been a member eight days before your birthday in order to redeem your free ice cream and for 35 days to receive the voucher. It’s time to get something good into you… Sumo Salad’s Sumo Society will give you a free salad on your birthday. You must collect a membership card from in store to sign up. Gloria Jeans grants members a free drink on their birthday. Panchos in Victoria Park and Mount Lawley will treat you to a free birthday meal and dessert if you join their VIP Gringos Club. You must present your birthday letter to receive your freebies, but you can do so any time during your birthday month. Finally, if you still have some room head to the Spud Bar to claim your free birthday spud or salad, but only after joining The Secret Society of Spud. This freebie can be claimed on your birthday or the two days either side. Happy birthday and I hope you enjoy your food coma! If you didn’t make it all the way then you’ve got something to aspire to next year. 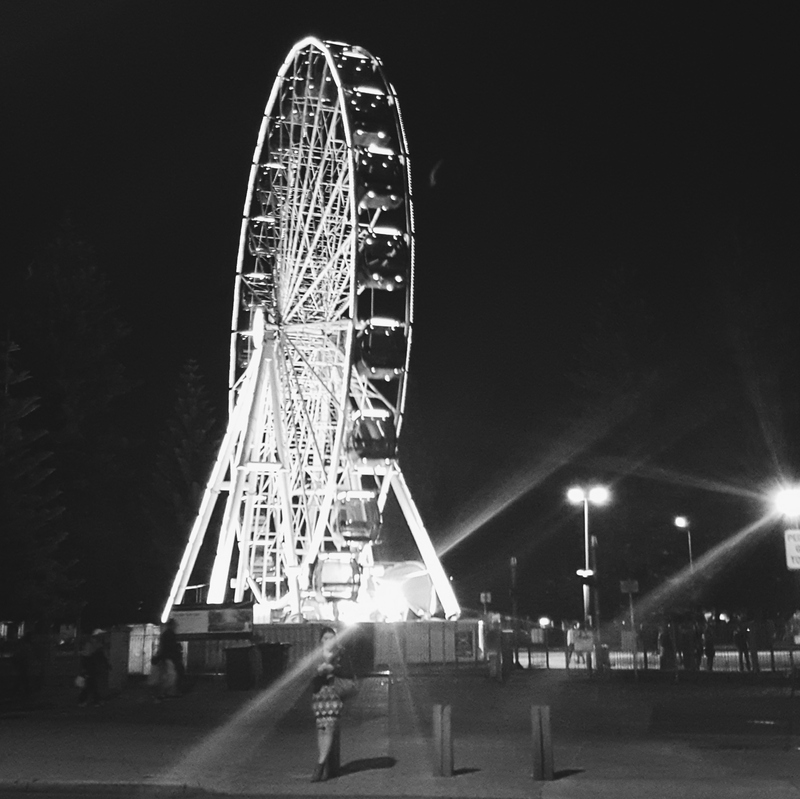 Last weekend I ventured down the long road to Fremantle to take out my newest American friend for dinner. I did a bit of research into places to eat in Freo on a Saturday night, only to discover that most of the places I have been keen on trying are only open for breakfast and lunch, so it looks like I’ll need to venture there more frequently during the daylight hours. We ended up at Little Creatures Brewery right on the waters edge. This place is large and impressive. I’ve only been here once before a long time ago and had fond memories of the steak sandwich. We found our own seat inside among the ginormous beer kegs and a waitress soon brought us menus. A quick glance down the menu and I realised I was starving, having been on a long ride that day and forgetting to snack between lunch and dinner (that is so unlike me). I was craving carbs so I ordered a woodfired pizza. 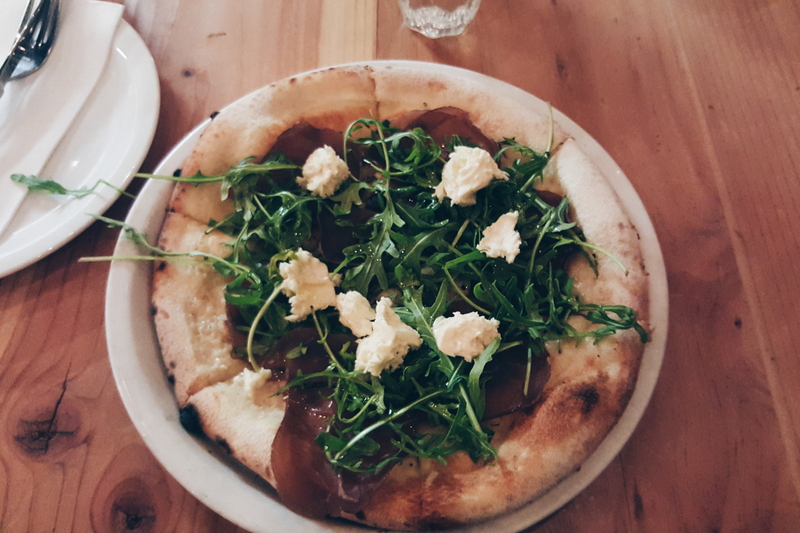 I had the cured beef, rocket and bocconcini pizza and I devoured the entire thing. The perfect size for one (one hungry little person that is), this woodfired pizza was delicious but possibly on the touch too salty side. 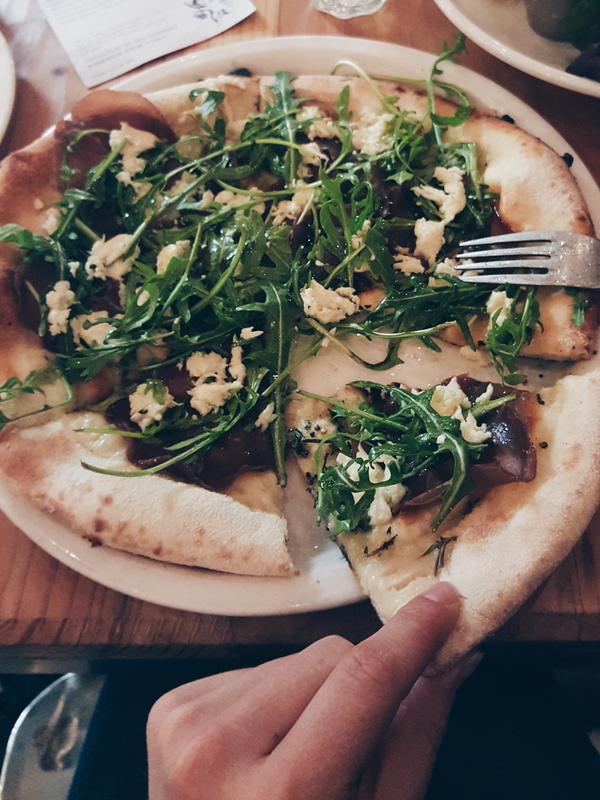 I loved the addition of rosemary and sea salt to the base of the thin pizza. However, with the addition of the cured beef and cheese there was quite a lot of salt going on. Thankfully I needed it that day after my exercise so it was all too easy to put away. 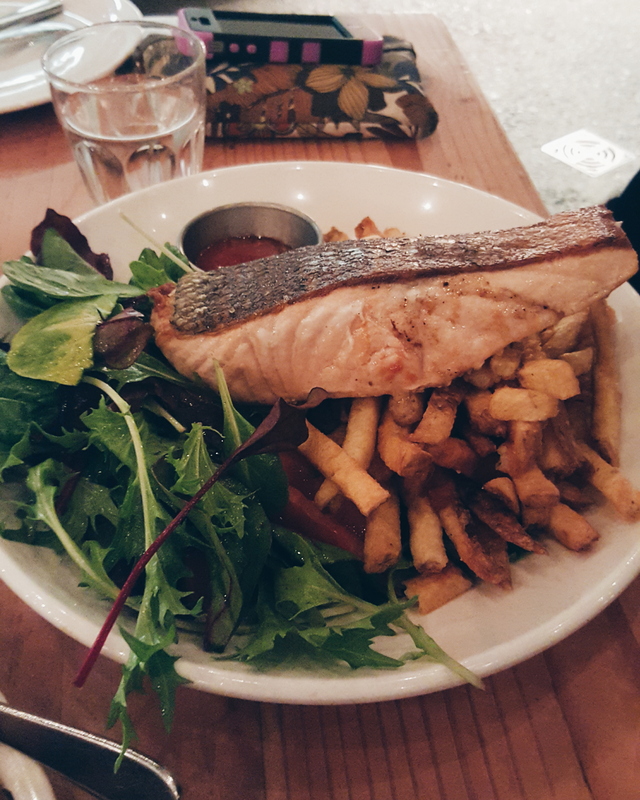 Allison ordered the salmon, which was an impressive chunk of fish. Unfortunately it wasn’t cooked all the way through (probably due to the piece being so thick). She still enjoyed the dish and the fries looked beautifully homemade (some with the skin still on). The payment service at the table was easy and convenient and they kindly let us split bill. After dinner we enjoyed a pleasant walk along the Cappuccino strip before heading home. 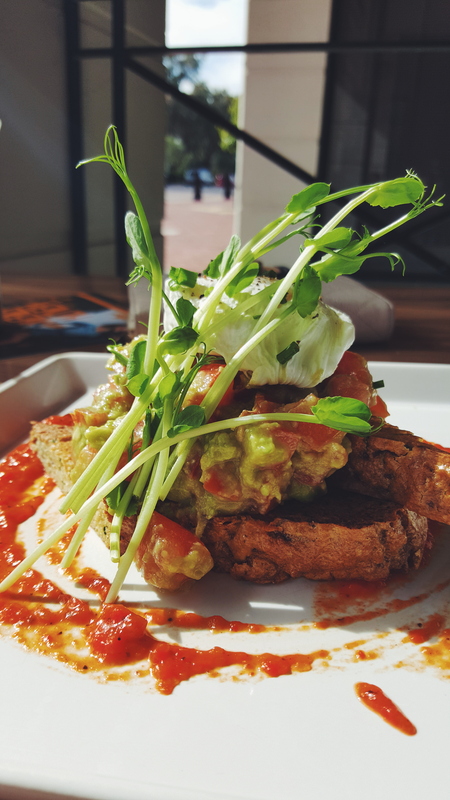 I’m a firm believer that weekends are for brunching, and although it sometimes takes a bite sized piece out of my pay check each week I have no regrets about catch up dates that involve muesli or eggs in one of Perth’s many delightful breakfast spots. The weekend just gone was spent like many. Saturday morning Lauren and I fitted in a triathlon training swim, a nice slow 1.2km for me that morning as I felt I may have pushed myself right to the edge with exercise during the week. Then we headed out for that all important post-workout refuel to one of my favourite places in Joondalup Health Freak Cafe (there is one also located in Scarborough). I love going to a place where I know that I can’t go wrong with anything on the menu because all the meals are packed full of goodness. 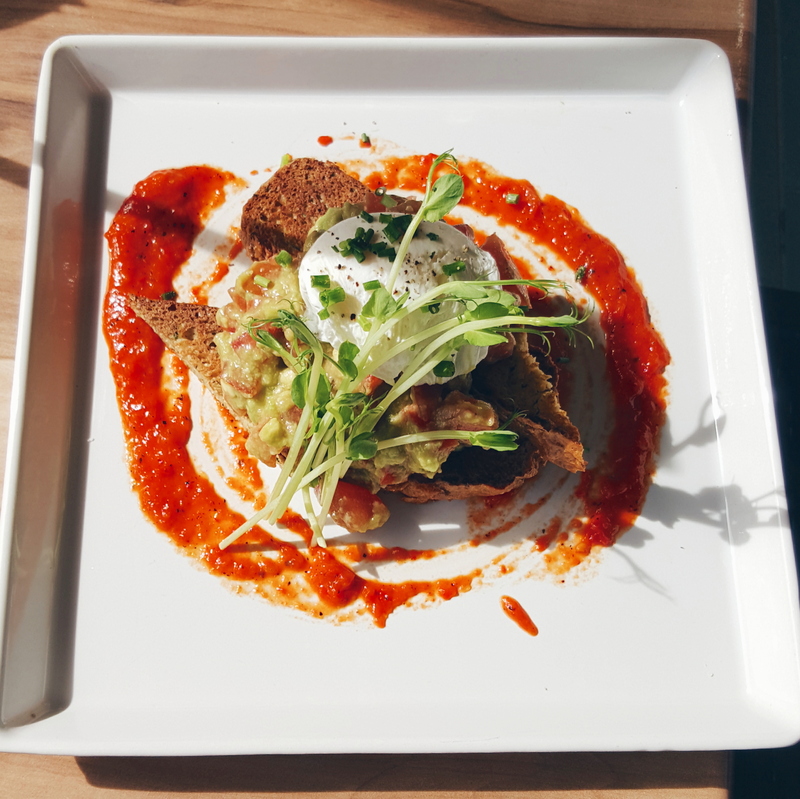 On this occasion I opted to try something new and ordered the paleo zucchini bread topped with an avocado and tomato salsa and a poached egg and surrounded by a capsicum sauce. The zucchini bread was quite plain on its own but under the salsa and egg it was delicious and so lovely and moist. I could still happily eat the bread on its own though as I love hearty snacks and don’t mind things lacking in sweetness now that my tastebuds have adjusted to a less sugar filled diet. I also couldn’t go past my favourite Cookies and Cream smoothie despite the $10 price tag. It’s so great drinking something that tastes amazing and sweet but is so good for you. The smoothie includes a banana, dates, almonds, coconut, chia, cacao nibs and coconut milk. Yum! On Sunday morning I enjoyed another delicious catch up with a lovely friend at Joondalup’s Gipsy Boy Boutique. This was the third time I’ve been here and the third great experience. Not only does this place do awesome breakfast but they also offer a great range of designer clothes for sale that are all amazing. Twice I have succumbed to the quality and beauty of their garments and walked away with something, but this time I put on a strong face and walked out with just a satisfied belly. 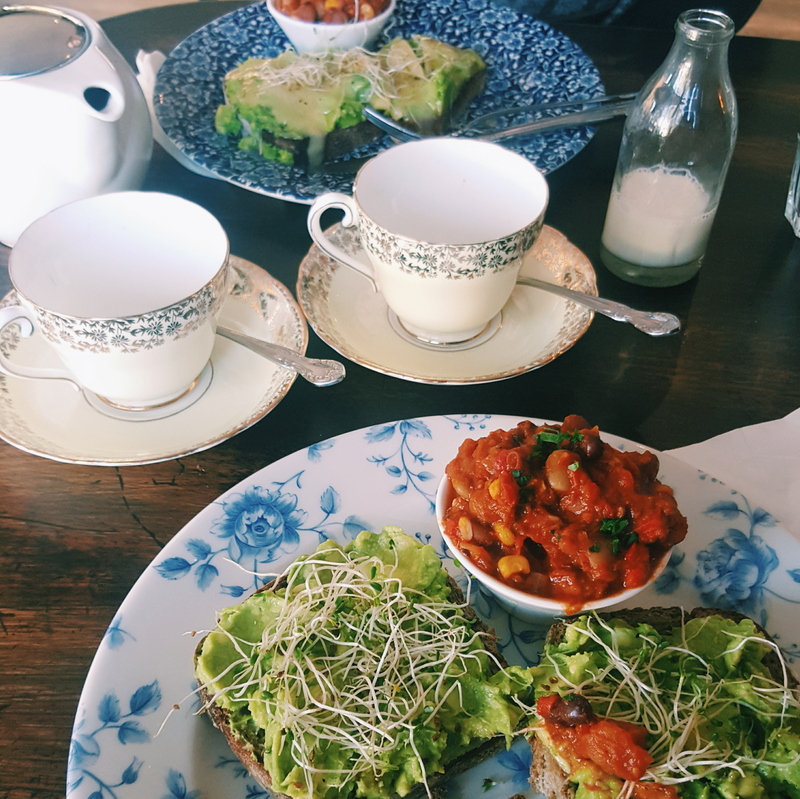 Yesterday I enjoyed their avocado and vegemite on toast with house beans on the side (I love beans and definitely recommend these). I’ve never had the avocado and vegemite combination before but it was a winner, the saltiness is a great addition to the avo. I also love the rye bread this place does, nice small but thick slices that are perfect for the toppings. It may be only Monday but i’m already looking forward to new brunches this weekend! We are well and truly living in a food revolution and it’s fiercely competitive. Meals are more elaborate than ever, desserts far more decadent, and restaurant owners are realising that their customers care just as much about their dining environment as what is on their plate. Reality TV shows such as Masterchef and My Kitchen Rules have fed our desire to see people take food to new heights and from this Tuesday Channel 7’s Restaurant Revolution will hit our screens. The show sees teams from five of Australia’s capital cities competing to turn their restaurant vision into a reality. 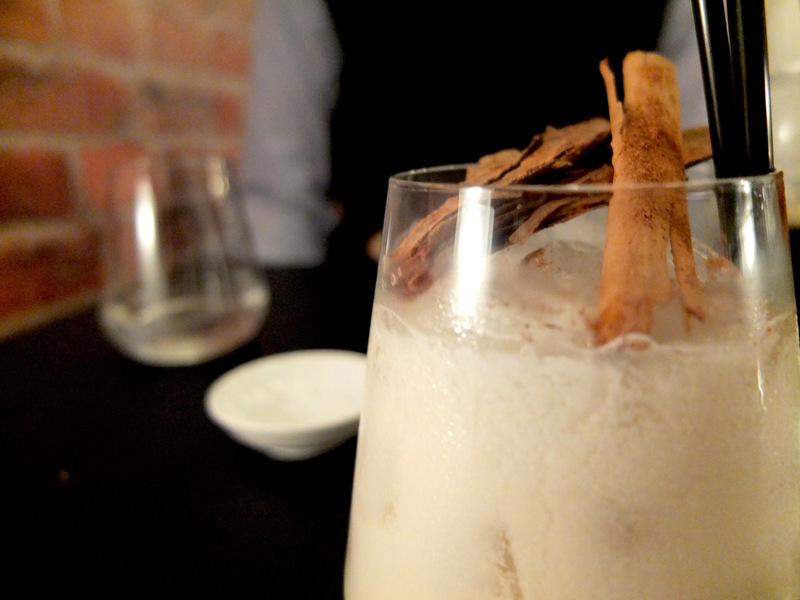 Perth’s entry into the competition is Spanish restaurant La Linea in Leederville run by WA sisters Carmen and Nicole. 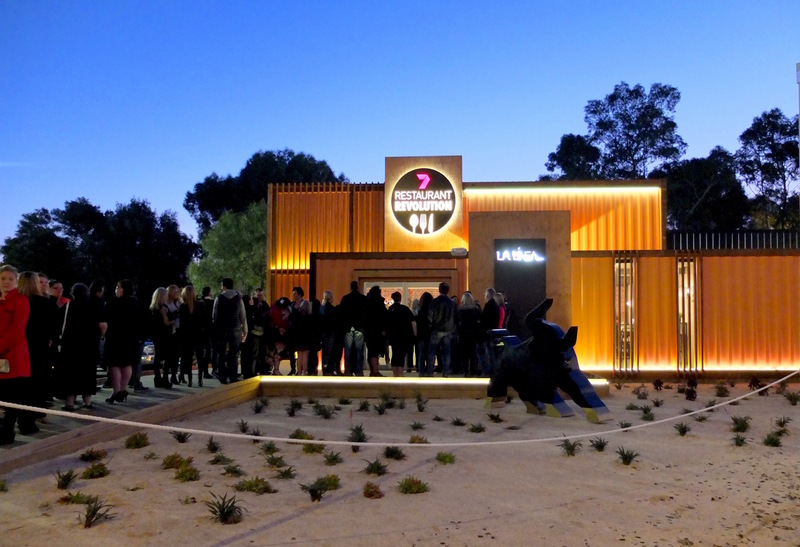 The restaurant, which opened this week, has been temporarily set up inside a number of large shipping containers. While it’s unusual appearance certainly makes a statement on Oxford Street the inside of the restaurant is lovely and quaint. 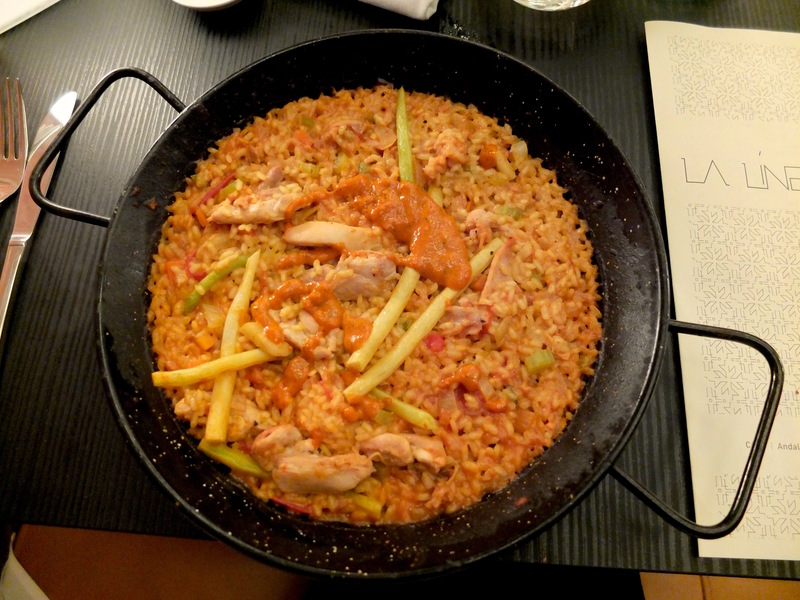 La Linea is on the small side for a restaurant and has a cosy and intimate feel. The back wall, on first glance, appears to be brick, but amusingly is just a wallpaper — well played. The decor follows the mantra ‘less is more’ with fake candle light fixtures and a floral wall near the entrance, there’s just enough to create a nice space without going over board. 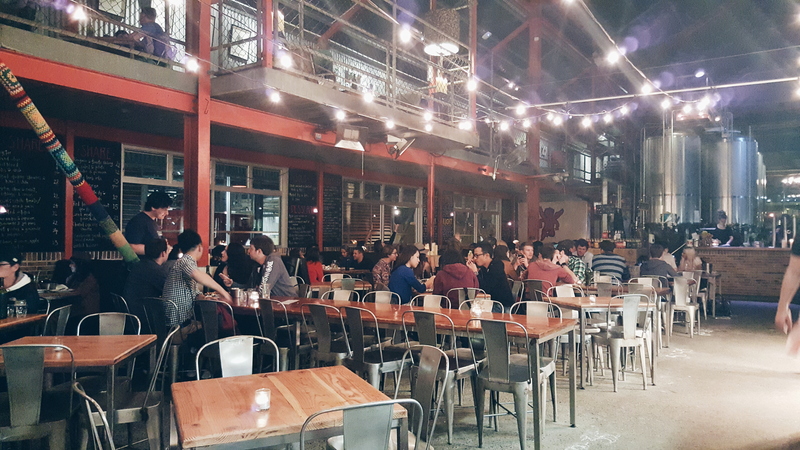 The largest part of the restaurant has been built using stacked shipping containers, which create a high ceiling and provide a great feeling of space for a small place. 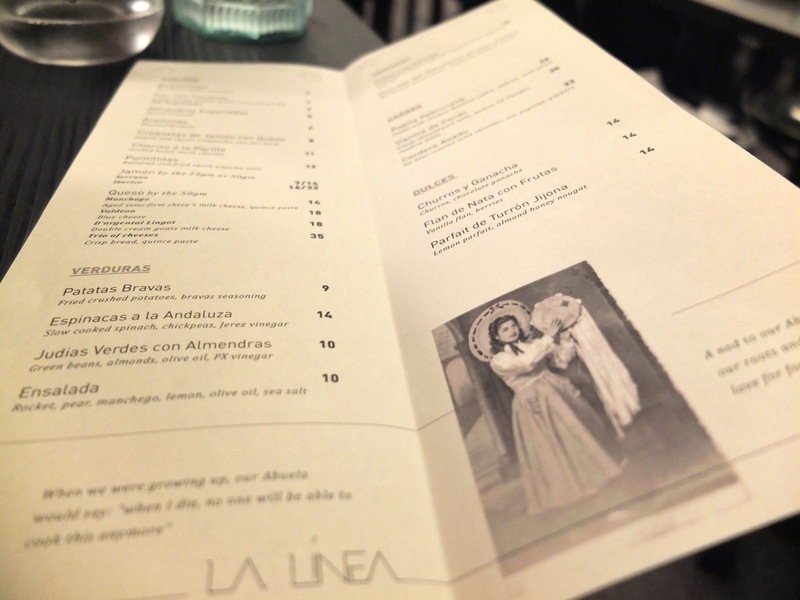 La Linea has a tapas style menu and customers may find they need to ask a few questions of their waiter to decipher it. To start we ordered the Pan con Tumacas (crispy bread, tomato, garlic, olive oil and sea salt) and the Croquetas de Jamon con Queso (jamon and cheese croquettes). 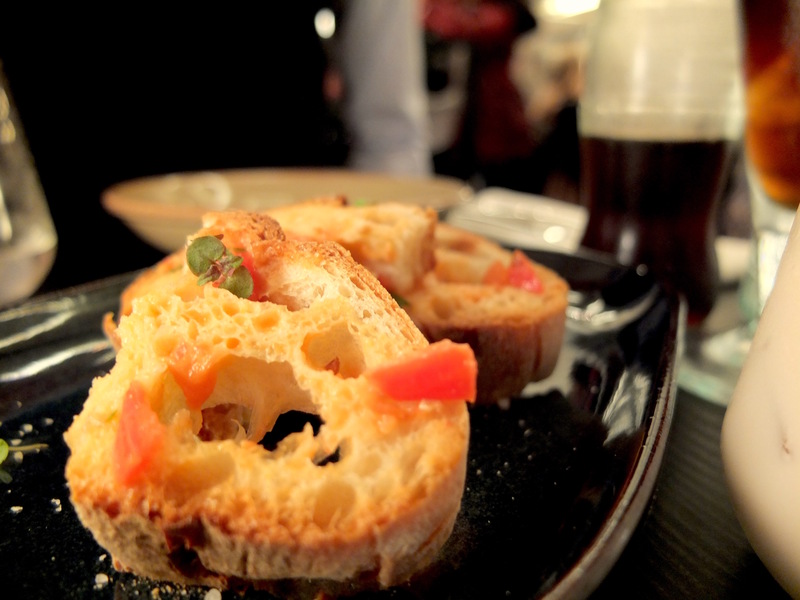 The bread was a nice light starter, slightly salty and very well seasoned. The waiter recommended adding the Boquerones (marinated white anchovies) as the saltiness would complete the bread. We didn’t add the anchovies and I feel they may have made the whole meal far too salty. 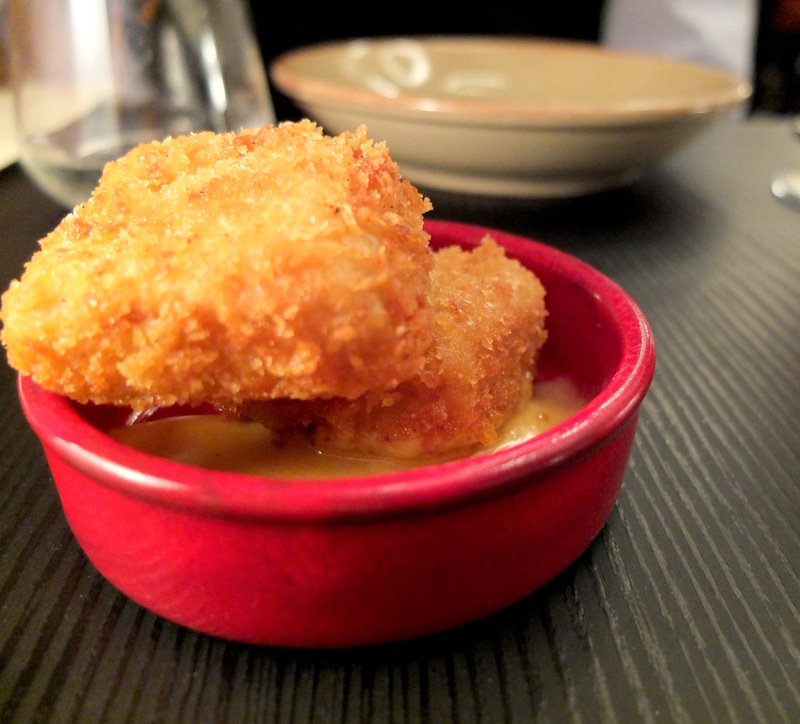 Cheese lovers would scoff down the croquettes, which quickly sold out on the night and have been a popular menu item all week. 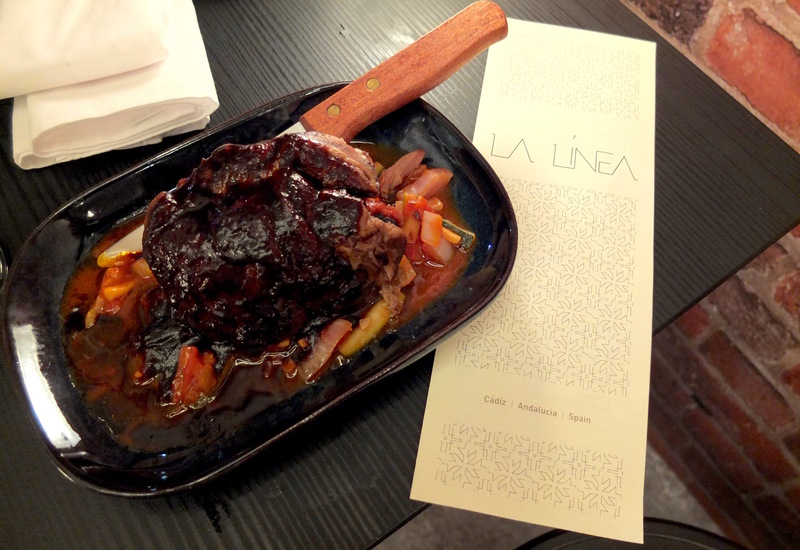 We also ordered the Cordero Asado (six hour roasted lamb shoulder, jus, paprika, peppers). The shoulder was an impressively large piece of meat which fell beautifully off the bone. The jus was the perfect accompaniment and balance of flavours. With such reasonably large meat dishes we were feeling quite full, so to finish we shared the Flan de Nata con Frutas (vanilla flan with berries). For those who like something to finish but without the sickly sweet end of a meal hangover this flan is perfect. 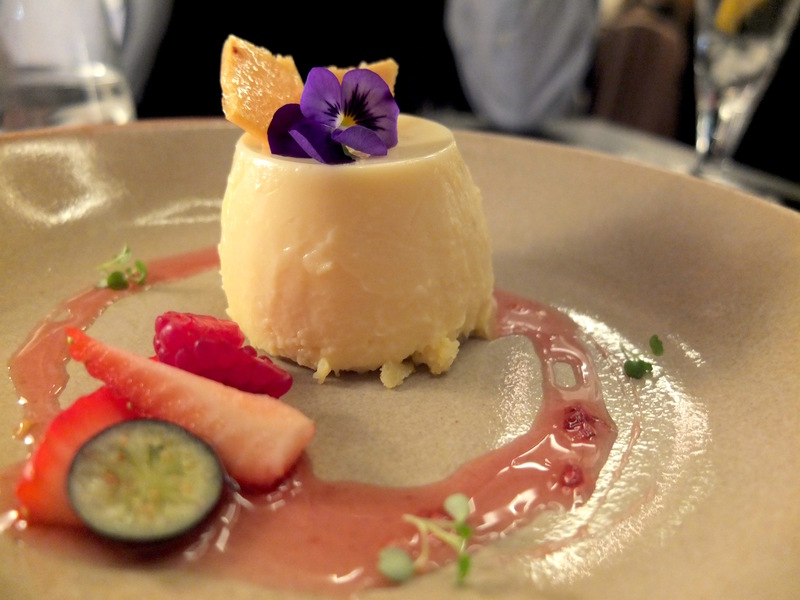 Topped with two very sweet pieces of toffeed honeycomb, the flan refreshed the palette with a hint of sugar without the overload I have come to expect from most restaurant desserts. La Linea is open Wednesday to Sunday for lunch (12-4pm) and Wednesday to Saturday for dinner (6-11pm) at 103 Oxford Street Leederville. Restaurant Revolution airs on Channel 7 Tuesday July 28. Thursday night was a bit of an adventure. John and I had tickets to the theatre and I was going to pick him up from work beforehand to go out for dinner. 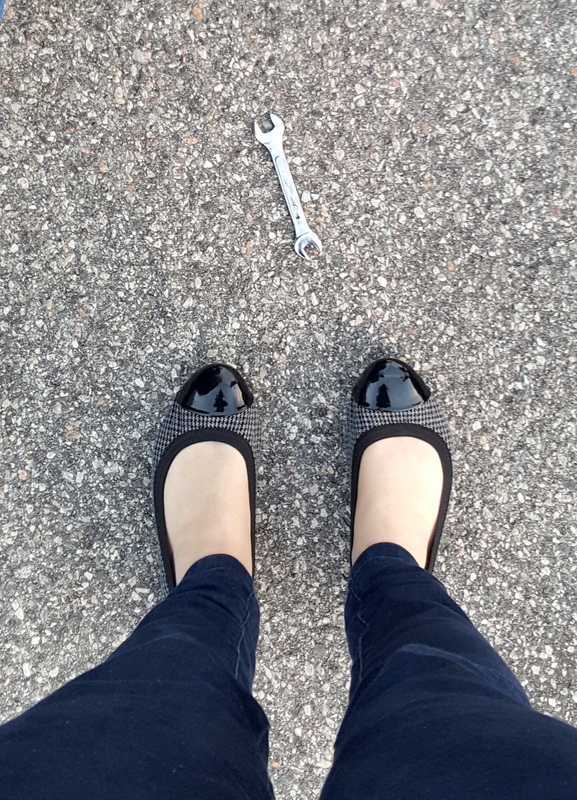 When i got to my car after work I noticed the back tyre looked a little flat. 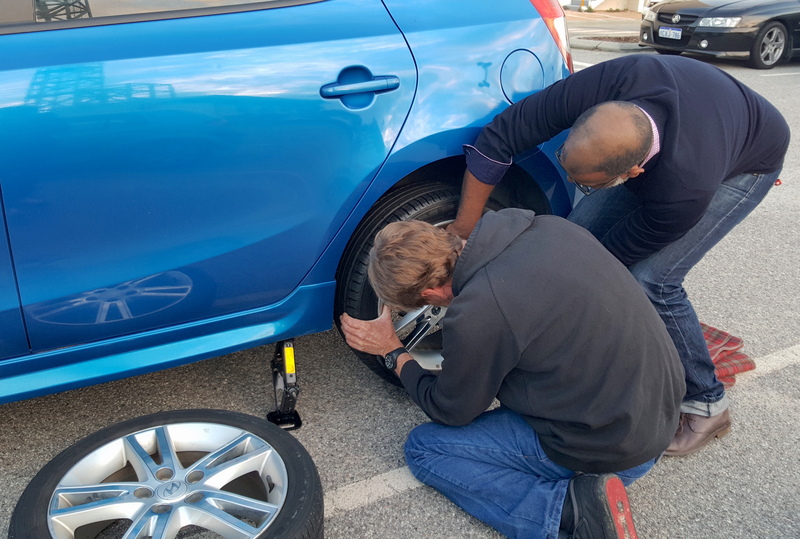 Sure enough, I had a completely flat tyre so I wasn’t going anywhere in a hurry because I don’t actually remember how to change a car tyre, despite this having happened to me multiple times. After having placed a call to the RAC, and feeling quite deflated at the thought of waiting up to 40 minutes before someone arrived, I decided to ask a group of guys standing outside on a smoke break. Thankfully, a kind older gentleman volunteered his services, along with another man, and soon we were well on our way to having a working car again. I don’t know what I should be doing with this. After that little adventure for the night John and I made it into Northbridge, picked up our tickets, and found ourselves seated inside one of the most charming restaurants the suburb has to offer — Pappa Rich. John had been here on one occasion before, but this was my first time. I quickly realised that this place was extremely popular — the queue rope barriers outside was a bit of a giveaway. Thankfully there was no queue when we arrived, as we only had a little while before the show started as a result of my car incident. Pappa Rich has a charming European interior with wood panelling, lamp posts and a sweet green, black and white colour scheme. 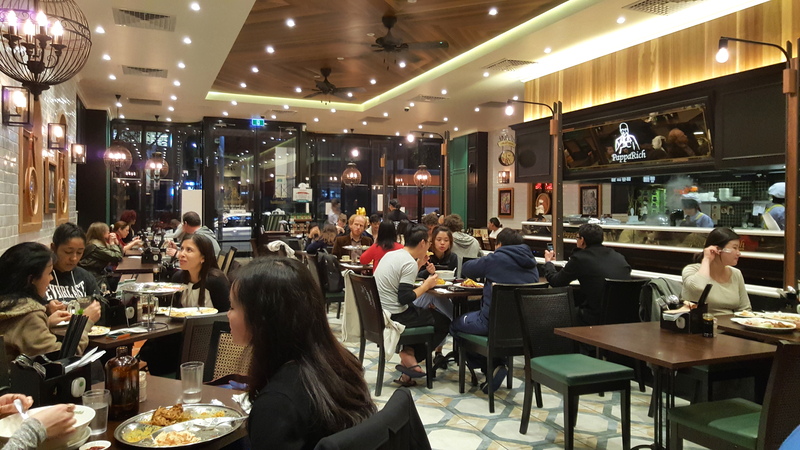 It is a Malaysian restaurant and features a range of curries, rice and noodle dishes, and more bubble tea and roti variations than I knew existed. Ordering here is almost something of a novelty. 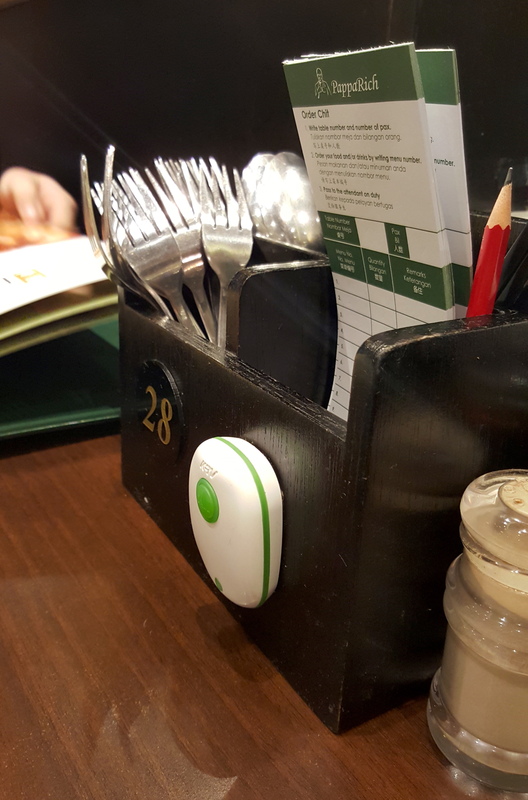 Each table has a list of paper to write down your order on and when you’re ready you simply press the doorbell like device on your table and a waiter will come and collect it. 1. When I’m dining out I will so often order something but ask for it to be without cheese or with soy milk or to have something on the side. Why? because I’m lactose intolerant and I suppose just fussy. This way I can make sure the kitchen receives my order correctly without being an unnecessary annoyance to the waiter. 2. I can take as long as I want to decide what to eat without feeling like I’m constantly sending the waiter away because I haven’t looked at the menu yet or can’t make up my mind. For drinks I ordered a coconut ice drink which looked beautiful simply because of how white it was. It came with bits of coconut flesh and topped with a mint leaf. 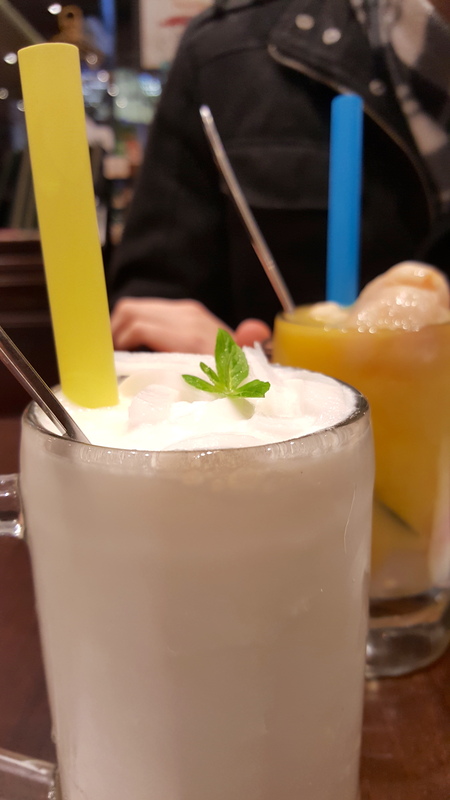 It was delicious and so refreshing. John had a mango drink that came with lychees and watermelon balls. It also looked amazing but i found it slightly too sweet. 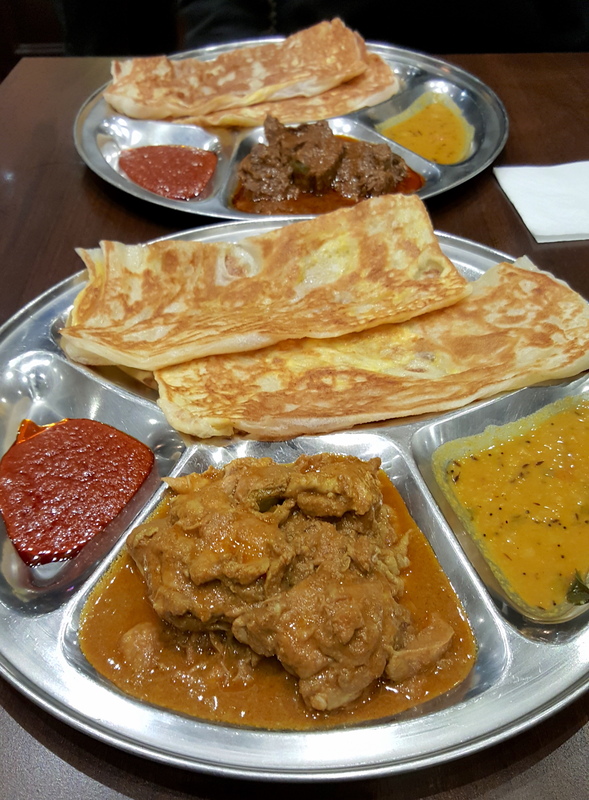 For dinner I ordered the roti telur with chicken curry while John also ordered the roti telur but with beef rendang. Roti telur is basically roti bread folded over a cooked egg. I had never eaten roti this way and it was delicious, The egg added a wonderful flavour but still kept the roti nice and simple for lapping up the curry. The meals were served with two accompanying sauces. The red sauce (I don’t know what it actually was) was far too hot for either of us and after one taste, and a desperate attempt to soothe my tastebuds with some coconut ice I decided to give that one a miss the rest of the night. John’s beef had more heat than my chicken curry, which was lovely and mild. 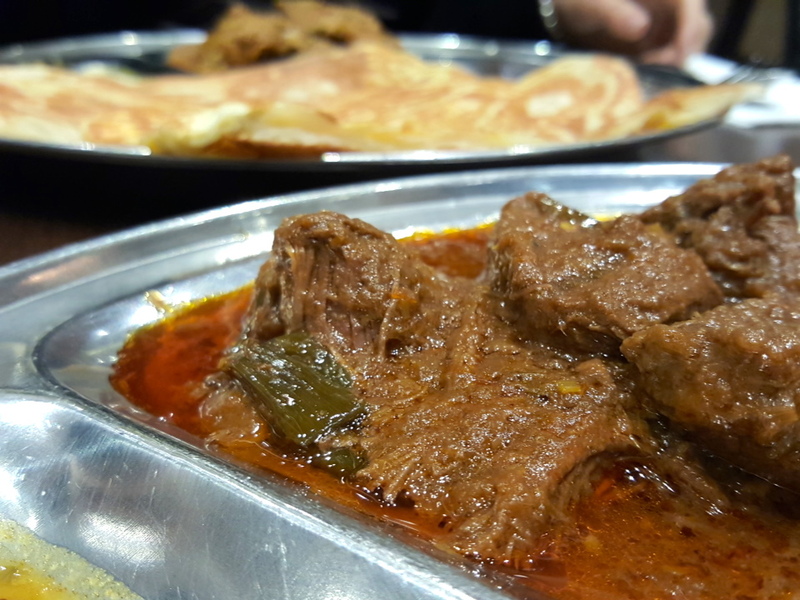 We both really enjoyed our meals and although they look small, as it’s only meat and roti (two large pieces), we were very full. If you’ve never been to Pappa Rich and enjoy Asian cuisine then I would highly recommend a visit to this place. 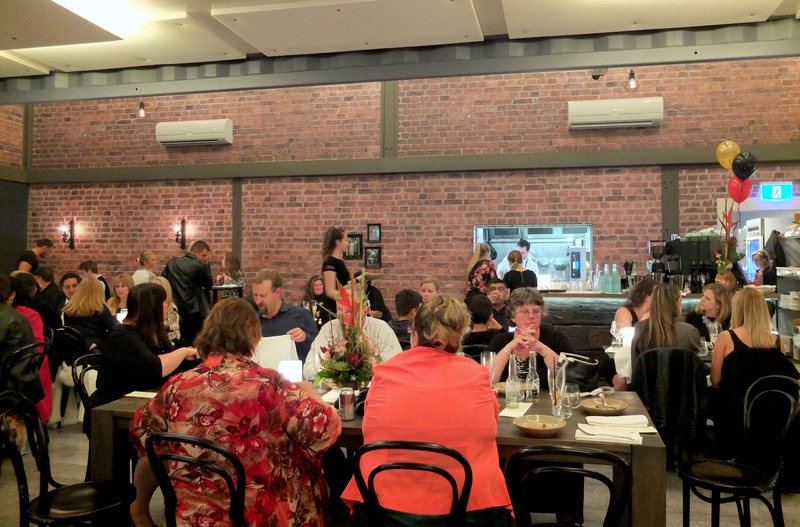 The atmosphere is charming, there’s plenty of options on the menu and the food is flavoursome. Open 10.30am- 9-30.pm Sunday to Thursday and until 10.30pm Friday and Saturday.